On Second Scoop: Ice Cream Reviews: Have you tried San Bernardo Ice Cream? Have you tried San Bernardo Ice Cream? I've got a few reviews in the pipe but first one more spotted on shelves type post. We were at a Price Rite in the city when we found San Bernardo Ice Cream. You can read the whole story here, but the idea is that they came to Florida long ago to bring tropical Cuban flavors to America. There were ebbs and flows in their history and then in 2014 they re-entered the retail market. They have several different product lines but it's the Tropical Escapes line up we found for a mere $1.99 a pint. 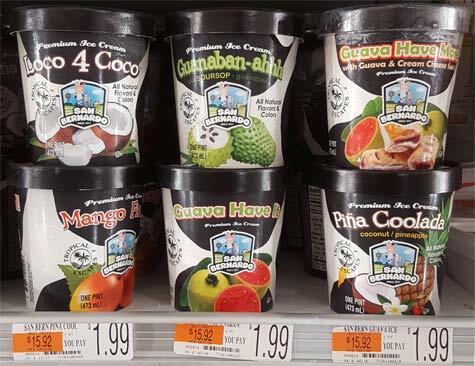 I saw Loco 4 Coco (coconut), Pina Coolada (coconut & pineapple), Guanaban-ahhh (guanabana & soursop), Guava Have It (guava), Guava Have More (guava & cheese), and Mango Fiesta (mango). They also have Cactus Pearfection (red cactus pear) and Mamey Magic (mamey) in this line up. So have you or would you try something from San Bernardo? I used to see these all the time at the supermarket near my school, but I never bought one because the pints were always soft to the touch -- as if they were melted because that section of the freezer wasn't cold enough. Very strange. I'd try them if I found them at a better store, though! Living in Yokelsville, Virginia these flavors are not available to me. "Sweet potato, pumpkin, honey, peach, apricot, cantaloupe, cherry, and almond"
As a general rule I don't care for fruity ice cream, unless it's pie flavored, but that sounds interesting enough for me to try if I happen to see it. I love eating fresh mangos, but I don't really go for that in ice cream. Guava and cheese sounds disgusting. I've seen this ice cream at Safeway and Shoprite in the past and it's real hit or miss for me! Safeway I notice sells more of the Tropical Escapes whereas I can find their Italian Escapes at Shoprite (for a much better price for also around $1.99 a pint). Out of the Italian Escapes, I've tried the Amaretto Praline Pecan (AMAZING - they nailed it), Cannoli (very underwhelming), Italian Cheesecake with Raspberry Swirl (also underwhelming), New York Style Cheesecake (better, but left much to be desired), Spumoni (ALSO AMAZING - tied as my favorite with the Amaretto and it has the same underlying amaretto flavor to this one as well), and Tiramisu (underwhelming). Out of the Tropical Escapes line I've only tried Guanaban-ahhh (very weird flavor that I can't explain and I finished eating, but wouldn't buy again). Never seen or heard of it, but then I've only been in Florida for seventeen years and they discontinued/sold out the San Bernardo brand years ago. The big "ethnic flavor"(coconut, mango, etc) brand here seems to be Valentini's and they're pretty good if you like fruit/coconut flavors. Preferred their older "rad" packaging that stood out rather than the new one that makes them look like a bad generic store brand. It's just too easy to forget that they're there among the 700 plus (I had to check what the brand's name was) frozen treats at the local grocery. I tried cannoli and biscotti or something... neither of them impressed me. Gave up at that point.